Discussion in 'Map Factory' started by Sushi_D, Jul 19, 2010.
hmm.. 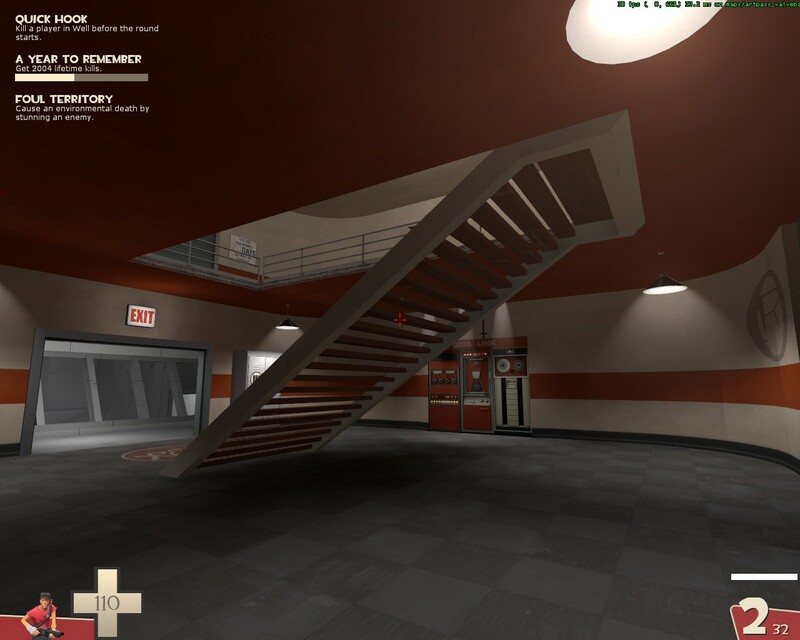 I am liking this valve coloring map contest. 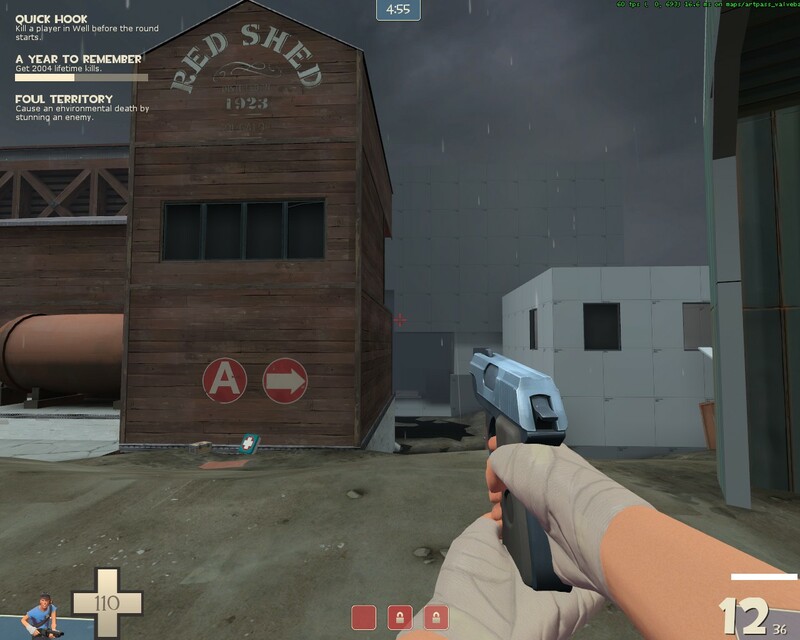 I'm re-using/updating a "hard rain"-esque rig i made earlier but never actually used for use with this map. I'm still generally in the early early planning stages and currently I'm just trying to get the weather effects working juuuuuuust right before i delve into actually detailing/lighting the map. 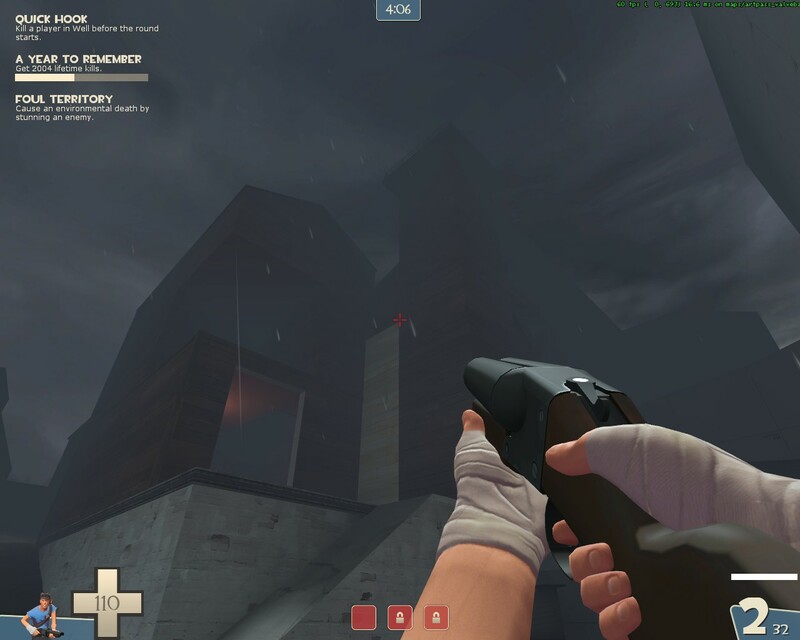 The theme of the map is "Evil Weather Machine". 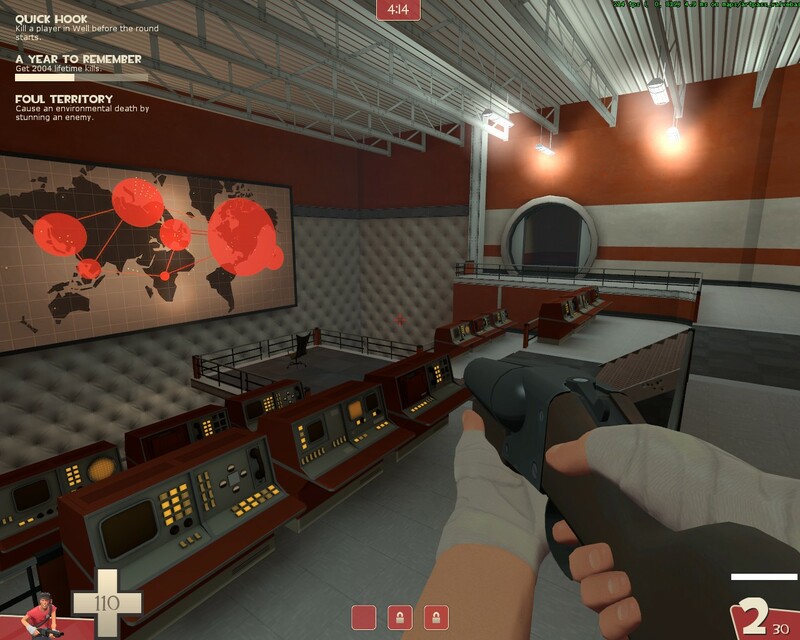 I'm probably not going to stray too far from the usual tf2 look. 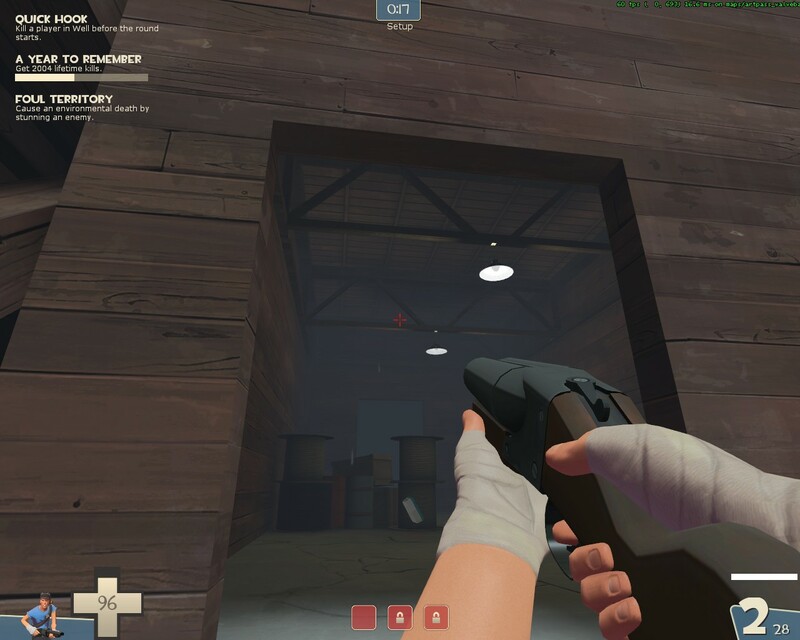 So you can expect a level progression that goes from 'Alpine' to 'Spytech' in a similar fashion to 2fort's Farm/Spytech shenanigans. I'm mostly gonna be dumping screens of my progress so far. 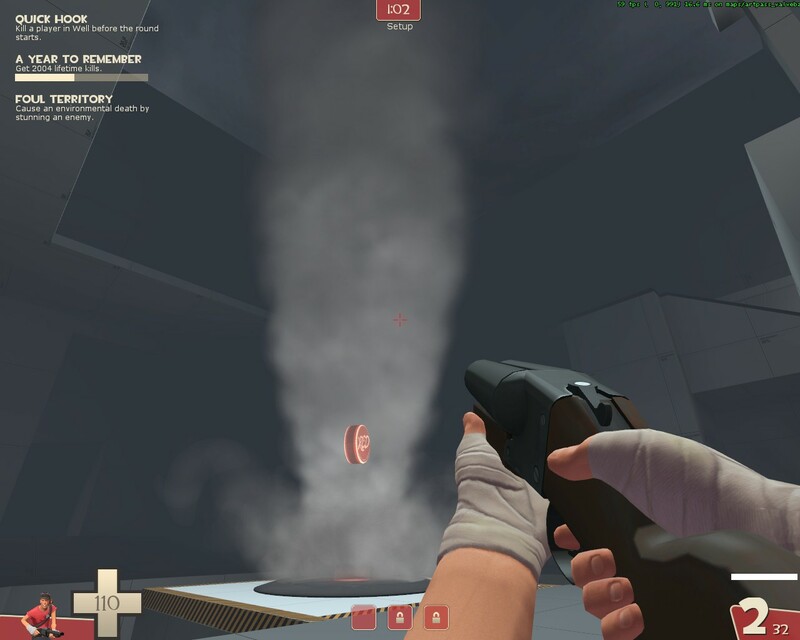 A tiny tornado.. On the last point there will be a weather machine to kill all the players when blue loses. 1) Ground puddles when viewed at a low angle are completely black making it not look good. 2) any way to make a trigger_push work on rag_dolls or some kind of work around? 3) any ideas for making the tornado more tornado-like? You need a bit less fog. I like everything else. Yeah, I agree. Also, your work is really nice and clean. 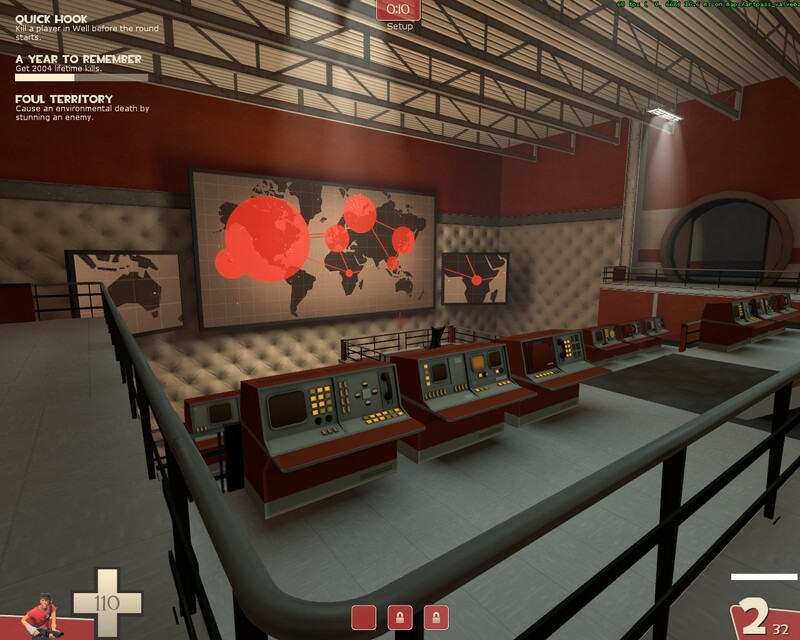 And the idea is really great, it's so original and already feels like something Valve might add to the game! 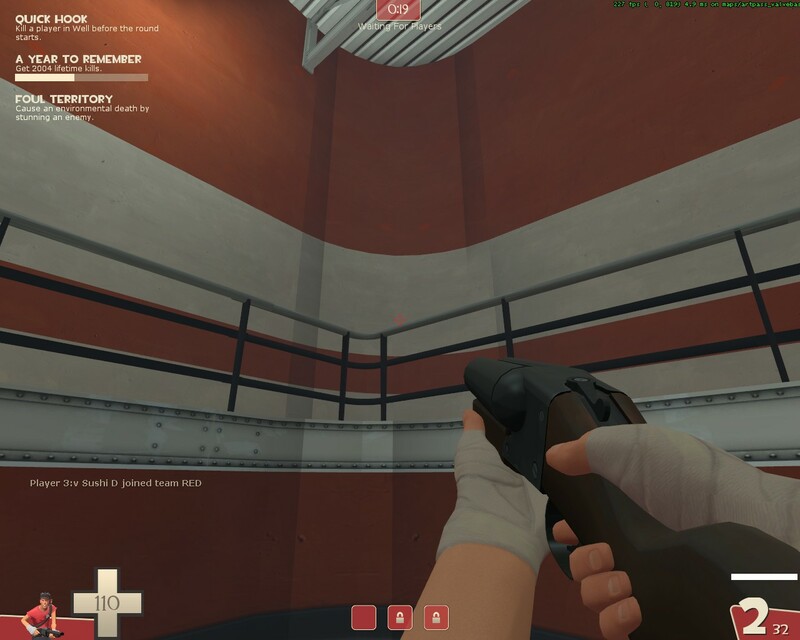 One should be able to stand in any spot of your map and be able to see everything they could see in the original map. 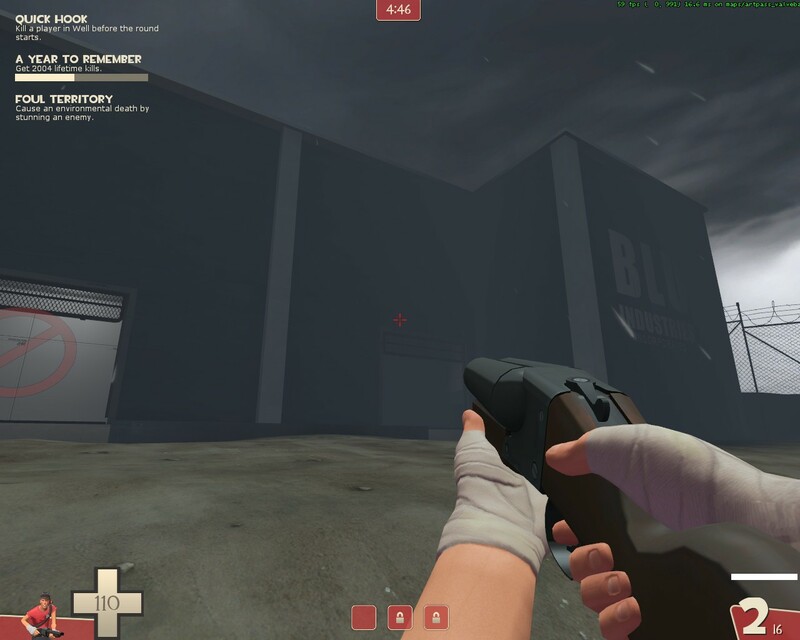 Sight-blocking fog changes gameplay! Tornadoes are a wonderful idea though. I can't see too much, like the others said - too much fog! other then that, the things that are detailed are looking good and the idea of a tornadoe is excellent! Took a few days to muck around with alienshwarm and its fancy tile based level generation system while at the same time getting some good practice in with hammer. Today I did some initial detailing for the rear red spawn room. Came across a problem though. These curved brushes aren't smoothly shaded. tried mucking around with the smoothing groups but that didnt work. Probably going to have to redo them. I probably just fooled around with them too much. Anyone got any tips on working with func_instances? I feel like they'd be useful for me. "hmm.. 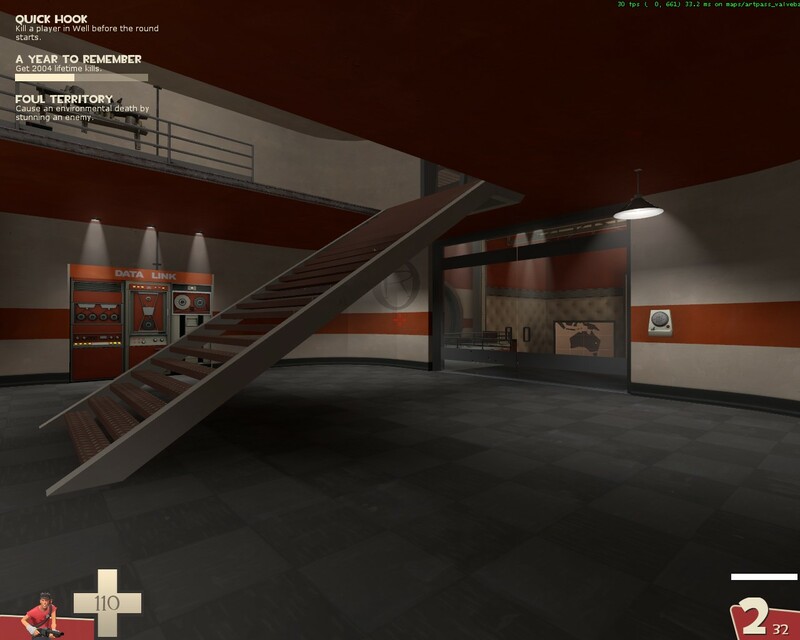 I am liking this valve coloring map contest." Instances probably not useful here. A: Your fog start distance is fine if you really push the end distance back. This will give you something closer to what I think you're looking for and should fix the sightline problems. Rest looks interesting, tornado was a nice attempt, red's detailing looks like a good start. Also the shadows ^ -- Is the corner a func_detail? This was it. I guess i was a bit too overzealous with the optimization there. i should start on the actual spawn room, now..
Yeah, rounded and beveled inner corners really don't really need to be func_detailed, since it's still a single visualization block. Just one with more polys. 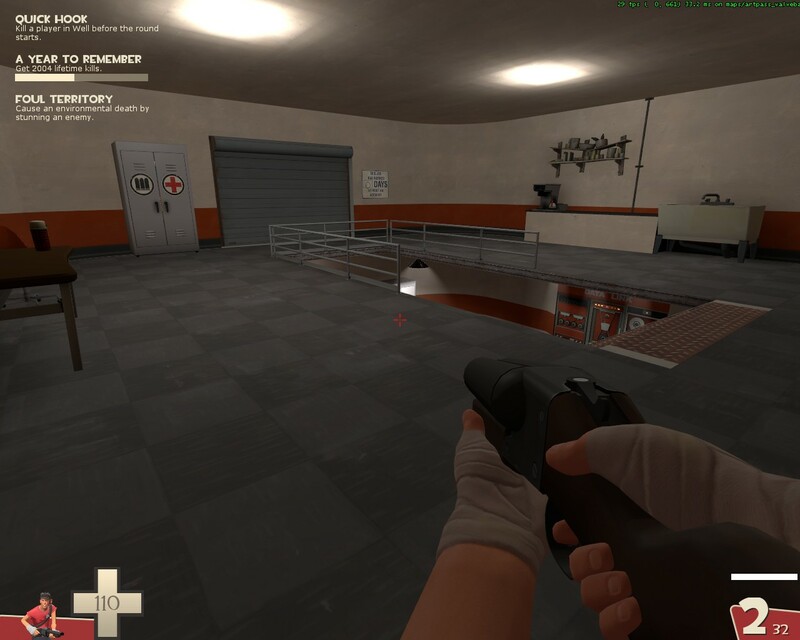 But Valve does it anyway, and it gives them problems too; note the first forward spawn in Well (I think). I don't know if a higher poly count on a vis block has any effect on framerate, but since this is a spawn room it really doesn't matter. 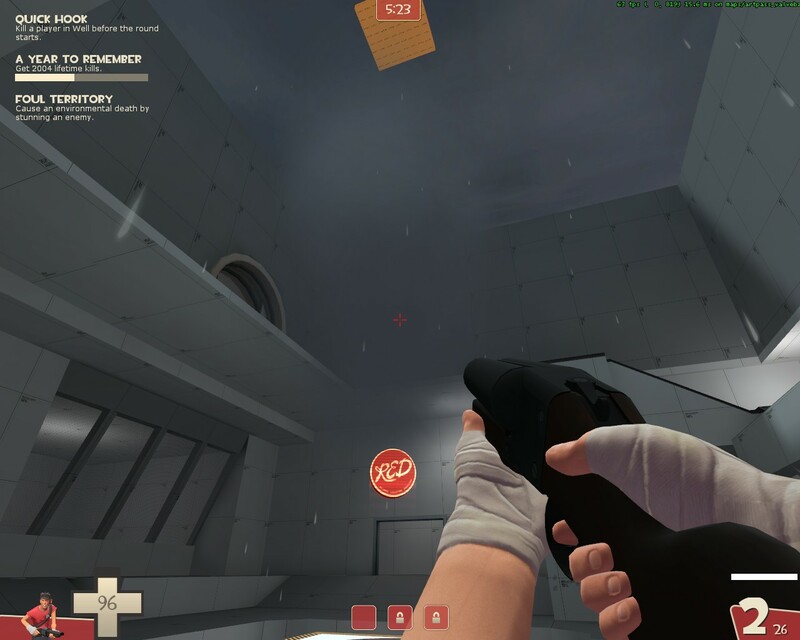 On another note, nice job with the lighting in there; I've never seen the mattressy wall texture look so 3D. started on the red spawn today. I am having trouble breaking up the visual flow while still trying to "stay inside the lines". Also, lighting errors with the curved brushes are still annoying me and wasting my time. 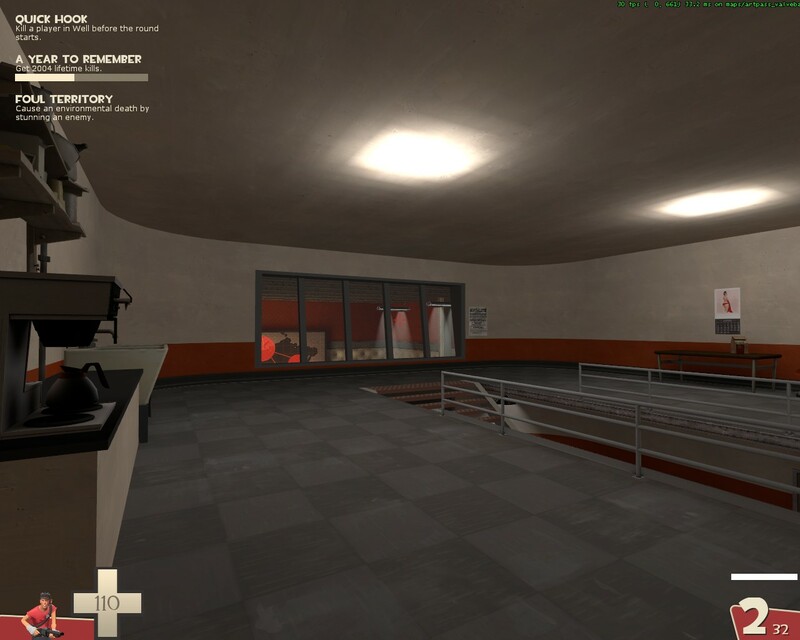 trying to go for some kind of employee lounge look on the second floor but, I donno. I added some rails near the stair/door but I'm not feeling them either. I'm trying to go for a rounded look to the inside of the base for that clean futuristic look though getting it to transition from that and the outdoorsy alpine look is going to be difficult. welp. lets see what tomorrow brings. I like the rain and the idea of a weather machine. Keep it up.